RANGERS took another big step towards securing their Sky Bet Championship status, as goals from Matt Smith and Conor Washington earned an important 2-1 win over third-bottom Wigan Athletic at Loftus Road. Following a thumping 4-1 victory over Birmingham City at the weekend, Ian Holloway’s charges followed it up with a second consecutive success. It means the R's are now 10 points clear of the dreaded drop zone - and also unbeaten in nine against the Latics. 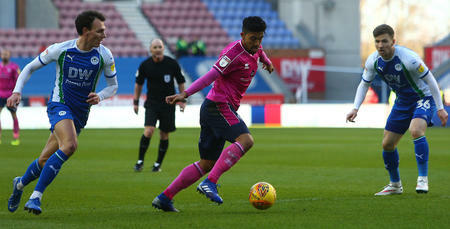 After scoring his first QPR goal at St. Andrew’s, Smith needed just four minutes to register his second versus Wigan, firing home at the Loft End. Athletic’s Omar Bogle levelled matters from the penalty spot in the 17th minute, after he was brought down by Joel Lynch in the box. But it was the Hoops who would ultimately take all three points, as Washington – who also scored on Saturday – struck from 20 yards in the 60th minute to win it for the hosts. Following that Birmingham triumph, Holloway named both an unchanged starting XI and bench for the visit of Wigan. That meant that Rangers once again lined up, in a 3-5-2 formation, as: Alex Smithies; Nedum Onuoha, Grant Hall, Lynch; Darnell Furlong, Luke Freeman, Ryan Manning, Pawel Wszolek, Jake Bidwell; Smith, Washington. The Hoops’ four-star performance at the weekend was their best of the campaign so far. And QPR wasted little time in stamping their authority on this contest, taking the lead inside five minutes. It was a route-one move that led to the goal. Washington eventually took full control of a long ball forward on the left-hand edge of the penalty area, before squaring to a waiting Smith in the box. The former Fulham man then made no mistake thereafter, shooting home from 12 yards – despite goalkeeper Matt Gilks getting a hand to the ball – to hand QPR the initiative. A fantastic start for the R’s – and 1-0 was almost two just a few minutes later, with Manning’s 20-yard attempt tipped over the bar by Gilks. However, despite Rangers’ fast start, Wigan drew level from the penalty spot shortly after the quarter-hour mark. Bogle displayed impressive skill to take him past Lynch in the box but, as he skipped towards goal, the visiting frontman was then felled by the latter. Ex-Grimsby Town striker Bogle subsequently dusted himself down to take the kick and send Smithies the wrong way, for his third goal in only five starts since joining the Latics in January. That goal seemed to give Wigan added confidence, but chances dried up a little after the equaliser. Rangers were dealt a blow just before the half-hour mark – Hall being forced off with what seemed like a facial injury. So on came Brighton and Hove Albion loanee Kazenga LuaLua in the 28th minute. That substitution also saw the R’s adopt a 4-4-2 formation, but clear-cut opportunities were still few and far between before the break. For Wigan, Bogle’s goal-bound attempt saw Onuoha fashion a brave block in the 36th minute while, straight up the other end, Freeman was wide of the mark with a 25-yard drive. But the visitors would go extremely close shortly before the half-time whistle was sounded. Fortunately, Rangers custodian Smithies was on hand to display yet another stunning save this term, as he acrobatically turned Jake Buxton’s header from a Jamie Hanson corner over the target. 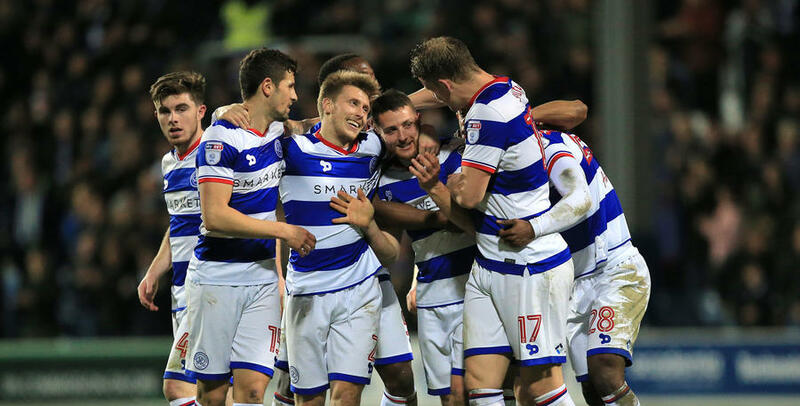 At the other end, in first-half stoppage time, QPR twice fashioned attempts through Smith – whose close-range effort was tipped over – and then Wszolek, whose header was caught by Gilks. However, in truth, both did little to trouble the Wigan ‘keeper. Into the second half – and the visitors went close following a swift counter attack in the 50th minute. Ryan Tunnicliffe went on a lung-busting run before eventually feeding Bogle on the edge of the box, whose thumping effort was tipped away by Smithies. Moments later, the Rangers ‘keeper was also called into action to save Buxton’s header from the resultant corner kick, catching the ball at the second attempt. But Rangers struck again on the hour mark to regain their lead, with what was their first real effort at goal in the second period. Washington exchanged passes with sub LuaLua on the edge of the box before shooting home – his crisp drive darting into the bottom left-hand corner. And three minutes later, QPR almost had a third goal. Freeman’s 12-yard overhead kick flew just over. Holloway then opted for a second Hoops change in the 68th minute, as goalscorer Washington was replaced by Yeni Ngbakoto. Ngbakoto almost got in on the act four minutes after his introduction. The Frenchman’s ambitious effort from range fizzed past the right-hand post. Rangers used up their third and final substitution 14 minutes from time, with QPR’s other scorer, Smith, making way for Idrissa Sylla. Soon after, the R’s went close again. LuaLua’s cross-shot saw Gilks produce a smart catch. As the clock ticked down, you sensed that a nervy finish may well be in store, with only a goal separating the teams. However, to their credit, Rangers largely looked comfortable – even in four minutes of added time – to secure the win. QPR midfielder Freeman tried his luck a minute into injury time, seeing a shot from distance fly over, meaning it finished 2-1. WATCH over 10 minutes of action from the R's 2-1 win against Wigan at Loftus Road.